All of the parties have chosen political moderates for the ministerial posts - with none of the party leaders taking positions in the goverment (except the SSNP, where the leader holds a non-portfolio post). Hizbollah gets just one Minister (plus one ally) - although their Opposition bloc gets 11 seats. They have given most of the Opposition seats to Michel Aoun. Two reasons - Hizbollah plays a difficult balancing act between criticising the political elite, and having its say in government. Second - the Hizbollah vote is guaranteed in the election next year, the electorate aren't going to jump ship and vote for March 14, but Michel Aoun's vote is less solid. Hizbollah desperately want Aoun to increase his share of the Christian vote, so that the Opposition bloc could get a majority in parliament. The rest of the ministries have been neatly divided up. Each appointment tells an interesting story. The Lebanese Forces get the Justice Ministry - that was important for Samir Jaja, who was imprisoned for murder in 1994, but released on a political whim, when his March 14 allies came to power in 2005. Michel Aoun's FPM gets the Telecoms Ministry - that's important, because it was a conflict over the private phone network run by Aoun's ally Hizbollah which sparked the violence in May. Future get the Finance Ministry - a very important area for them because of Hariri's control over so much of Lebanon's business. And Hizbollah get the Foreign Ministry - because of the party's raison d'etre (the Israeli threat). The President, Michel Sleiman, also gets to pick three ministers - including the key posts of defence and interior. Mustapha praises his choice for the Interior Ministry, an independent. And this is an excellent guide to the background and affiliations of each minister. Fouad Siniora remains Prime Minister - Sunni, Future Movement. Mohammad Chatah is the Finance Minister - Sunni, Future Movement. Ibrahim Najjar becomes Justice Minister - Orthodox, Lebanese Forces. Issam Abou Jamra becomes Deputy Prime Minister for the Opposition - Greek Orthodox, FPM (Aoun). Mohammed Fneish changes to Labour Minister - Shia, Hizbollah. Gibran Baassil becomes Telecoms Minister - Maronite, FPM (he's the son-in-law of Michel Aoun). Ziad Baroud is Interior Minister - Maronite, Independent, chosen by the President. Elias Murr stays on as Defence Minister - Orthodox, chosen by the President. 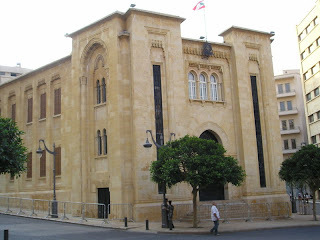 Image: the Lebanese Parliament, open for all your dirty political needs.